I went down to my old landlord's today in Chapala to get a note about the date I moved from Melaque. I needed it for my upcoming FM3 renewal and we moved the date around to fit the 30 day requirement. 3-4 visits to Immigration to record a move and 2 months later do it again to renew did not make much sense. His wife was home but he was around the corner doing the books for a business that cooked and sold Charales. He's an accountant known here as a Contador (Accountant/CPA). I was unsure if I'd had Charales before and certainly had not had fresh ones. His wife suggested we go meet him, look at the store and try some. It turned out they bought me a 1/2 kilo which the owner would not accept money for (from his accountant). Charales are common in most of Mexico's highland lakes. So anyway, they have spiced, plain and small pieces of a larger fish that looks like Chicharron when cooked. Buy in a fancy basket or by the kilo in a plastic bag. I asked if I could check out the processing plant so took the pictures below. 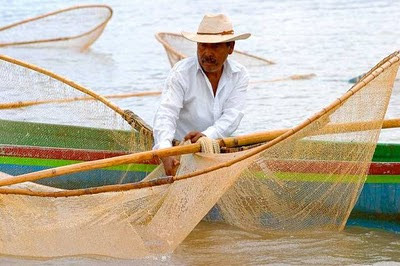 I don't know how they fish these things in Lake Chapala but assume with a fine net similar to the bottom foto from Patzcuaro - but I've never seen anything similar here. Supposedly the fishing is done near Mezcala where the water is cleaner. 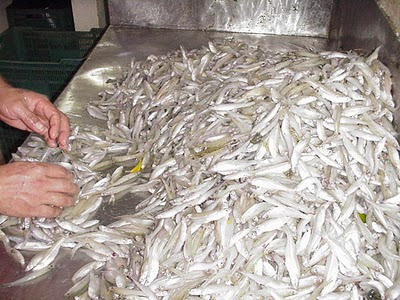 What ever you think about eating fish from the polluted lakes of Mexico ... I just thought they were the pure grease they were cooked in. Was suggested to place absorbant napkins at the bottom of a container and let them sit. 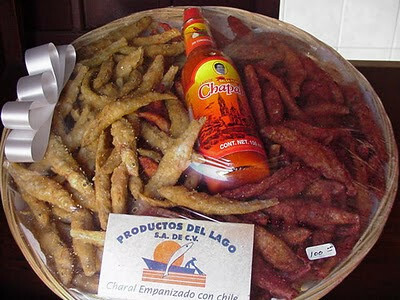 My brother-in-law visited Lake Chapala recently and brought back bags full of charales. They were in paper bags, which seemed to absorb alot of the grease. I placed them on a cookie sheet and heated them in the oven. Very good, and not the least bit greasy. Hot grease, lime and chile kills anything that could hurt you -- and besides, charales are an excellent calcium source. Enjoy. That said, come Lent, if someone tries to feed you nopales cooked with charales in mole, run. Run for your life. Call them charales all you want. They´re big minnows. Yuck. The spicy charales covered in chili powder are the best. I put them in a bowl and cover them in lime juice. 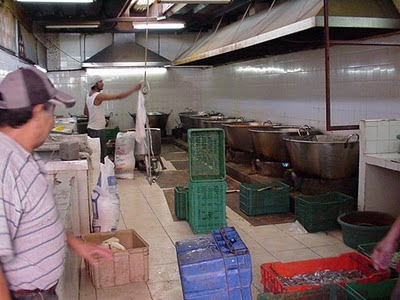 Usually I get a half kilo at the Mercado Hidalgo in Tijuana. They go great with a frosty Sam Adams or a Karl Strauss.